Last week we achieved some major milestones. See below for the latest updates on the project. The garden pit outside The Rock Shop was installed last week. This means all the garden pits, rain gardens, and tree pits have now been installed on the west side of the road. We have opened up more of the new road in Durham Street as far as the carpark building last week. This allows us to close the footpath and roadway to begin excavation for the new path. The final piece of stormwater drainage work on the intersection has been completed. We have also completed the main concrete slabs on the intersection. The curved concrete nibs between the new roadway and footpath will be poured this week. The laying of paving stones outside the Work & Income office is nearing completion. The remaining pavement work on the west side of the intersection is scheduled to be complete within the next 2 weeks. 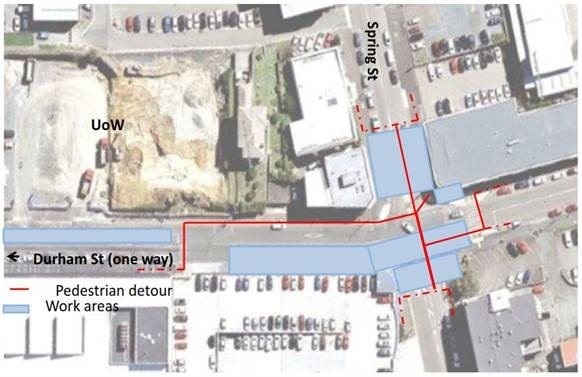 Pedestrians have been redirected through the intersection to allow us to finish the cobblestones outside WINZ and begin the footpath excavation beside the carpark building. There is still access from Spring Street east to the stairway in the carpark building on the corner of Spring Street and Durham Street. Please refer to the image below. New pavement work on the lane from the University of Waikato to Cameron Road has been underway this past week. Work on the section from the University to Spring Street will now start after Easter.